Yesterday, we got wind that T-Mobile would be discounting its iPhone range from today, and no surprises, the company has done exactly that. Every version of the iPhone 5s has been dropped by $48. The full off-contract price for the 16GB model is now $600, the 32GB model is $700 and the 64GB is going for $800. 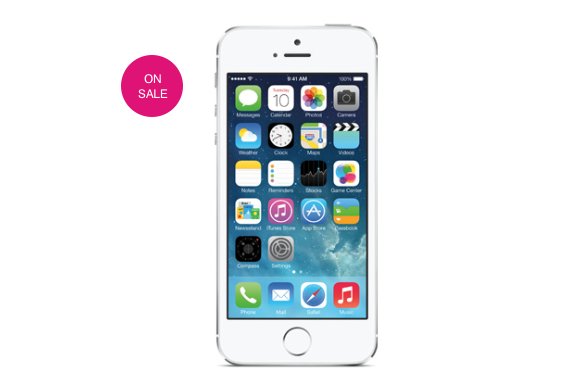 Similar discounts have graced the iPhone 5c line too. Customers looking to buy the 16GB will be able to grab it for $500, $50 down from its previous price, while the 32GB – like the iPhone 5s – has had its price slashed by $48, bringing it down to $600. We’re yet to see if older models are also being sold at a discounted price too. However unlikely, that would depend on whether or not stores had any old inventory left over. The devices are marked as being “on sale”, so it’s unclear how long the price-drop will last. If was to guess, I’d suggest T-Mo is trying to clear out some inventory in preparation of the onslaught of new smartphones being released between now and the holiday season. We’re expecting the iPhone 6, Galaxy Note 4, Moto X+1 and Sony Xperia Z3 to be announced over the coming weeks, and once they’re here, everything else will be old news. The iPhones are the latest of a number of phones to have their prices cut. You can also pick up the budget-friendly LG L90 for just $100, and get $50 off the Galaxy S5. Are you planning on picking up a discounted iPhone, or would you rather wait two weeks to see what Apple has up its sleeve? People would be ignorant to jump on this deal. The 5S and 5C will drop in price by $100 once the IPhone 6 releases in a few weeks. So why jump now just to get $48- $50 off when you can get $100 off these devices in a few weeks. Seems like a no brainier to me. Avoid this deal like the plague. Tmobile most likely wants to kill the stock they have around? Yup, T-Mobile is trying to get rid of its stock of these devices while still profiting in a hefty way. What do you mean making a hefty profit? First, carriers make little to no profit off phones. Second, T-Mobile may be know of jacking up phone prices that does not hold true for iPhones. That is because Apple is very strict about pricing. When I worked for T-mobile I was able to see the actual pricing they paid, because we were able to buy them “at cost” or lower. They made a hefty profit off of phone sales. I bought the HTC Amaze, 6 months after release, for $218 which was their cost. They charged $548 for that phone to customers to buy. You make a great point and I agree. I know that but my thought is directed at iPhones but didn’t make that clear my bad. I am talking about Apple phones because it’s Apples profit margin is ridiculously big when it comes to Apple products. Thanks Kalel for backing me up. He got a percentage discount on his phone, you worked for customer care, you had no access to what the bulk cost of the phones were. You know very well you got 2-5 upgrades per ur tenure. But we got a discount thats all. Did you just start working there? We got 2 devices per year at cost. If you worked there for over 5 years then you were able to get 2 free devices per year(tablet, phone, etc.). Yes, we were able to see the actual price. You don’t even know how many phones/tablets you could buy per year. You’ll have to excuse me because I might be a little confused on the subject, but the last time I checked, the point of a business is to make money. No one is forcing you or anyone else to buy. If they are “profiting in a hefty way” as you put it, I would say they are doing it right. You’ll have to excuse me because I look at this particular post of yours as trolling. The whole point of of being a smart consumer is to get the best price for yourself. What customer/consumer thinks oh let me go out and spend top dollar for the product so the company is most profitable. No one does that except the people who are in the company selling to someonelse. Of course TMobile like any company is in business to make a profit. However, that had nothing to do with my orginal post which was posting from the customer/consumer perspective where finding the best/ lowest price on something is key. Trolling? Seriously? That term is so overused on the internet nowadays. Someone disagrees with your statement & it’s considered trolling now. Get over it. Or cease to exist like the iPhone 5. Right on the money James! Wrong they have always kept the latest apple iPhone and the previous years model. They didn’t keep the iPhone 5 when the 5s came out because the 5c was released to replace the iPhone 5. The iPhone 5c was basically the iPhone 5 in a plastic casing. In addition, the iPhone 5c was selling for $549 upon release while the 5s was selling for $648 denoting a near $100 price difference between both models. I predict things would be a bit more complicated this time around. Rumors say with iPhone 6, Apple will remove 32GB configuration and add new 128GB configuration. I suspect only 64GB and 128GB will get sapphire coated screen, while cheaper 16GB will maintain traditional Gorilla Glass screen. iPhone 6c will probably replace iPhone 6. Essentially the same exact spec, but with plastic case. I am hoping that both iPhone 6 and iPhone 6c will add 700 MHz LTE band 12. Note: I am hoping that Apple would do better with pricing, knocking at least $50 off their entire product line. Just got my grandmother the L90…seriously even though it doesnt have lte the 4g in my area works great and is strong…im honestly thinking of getting it for myself since i have the galaxy light and am not a fan of Samsung since using the light. Only thing holding me back is the moto g2…but idk the L90 is quick and does what i need it to and with no hesitation…plus its only 99 bucks! We honestly need to continue carrying the 5s and 5c. A lot of ppl still ask for a 4s and 5. They want an iPhone and they r comfortable with an older cheaper version if they still have an iPhone. Typically we just end up selling them on a much cheaper android device but we should have the option… Just like every other carrier. I agree. I really don’t get why T-Mobile stopped carrying the iPhone 4S when all the other carriers kept it around as a budget option. I liked their iPhone lineup last year, when they had the 4, 4S, and 5. I think it had to do with the 4S not having AWS band support. T-Mobile probably wanted to have only the iPhones that support all of their frequencies in their lineup. Geez i literally bought two of these 3 days ago. Wonder if they can do a price adjustment instead. Do not want to return. The girls like the 5s size, and are not interested in larger screen iphone 6 (rumor). You can call and ask and see if they’ll adjust the price. What I am saying is that once the iphone 6 releases in a few weeks you could get the 5s for $100 off. That is why I said to wait on buying the 5S till the iphone 6 comes out in a few weeks. Oh and a new model iphone will come out in September or October and that a fact. The specs and stuff on the new iphone are rumors.